At the end of the 2015 fall semester, FIRE (and the nation) began to see a wide range of student activism, from the protests at the University of Missouri to advocacy for free speech rights at the University of South Carolina. As FIRE’s communication coordinator, I have had a few opportunities to travel to college campuses to witness how student activists are taking advantage of free speech and the First Amendment. This is an inaugural post that I hope will become a series in which I interview students from across the country about how they’re using free speech. Since I work in Washington, D.C.—home to many institutions of higher education—I decided to start with Howard University. It all started when Elder and McKenney began hearing disturbing allegations last month of numerous sexual assaults allegedly committed by a former student-employee. Believing that Howard didn’t do enough to keep students safe, the pair, along with other students on campus, felt compelled to do something. “No one was notified, no one knew about it until [one of the alleged victims] started tweeting about it,” said McKenney. Elder described Office of Residence Life administrators as “crazy” for failing to inform students despite the crimes having been reported to the university itself, campus police, and the Washington, D.C. Metropolitan Police. “You all didn’t let us know,” she said. Elder and McKenney decided to speak out. 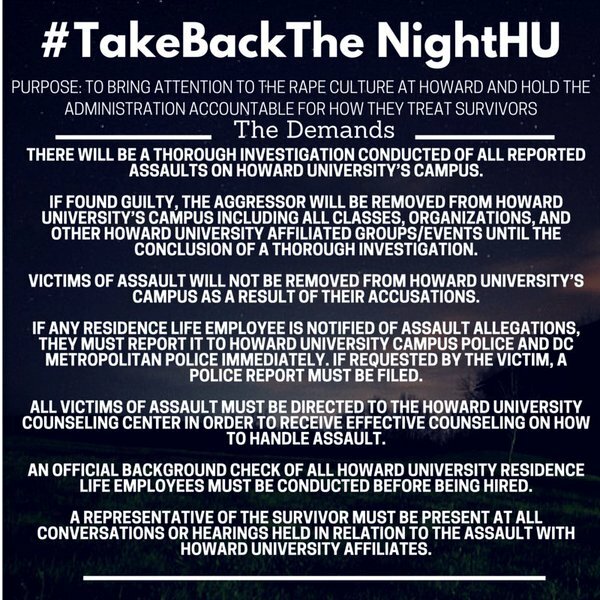 In fewer than eight hours, the team helped organize a demonstration to garner the attention of Howard’s administration. Elder also reached out to news outlets including The Washington Post, which covered the story, along with a variety of local and national media. 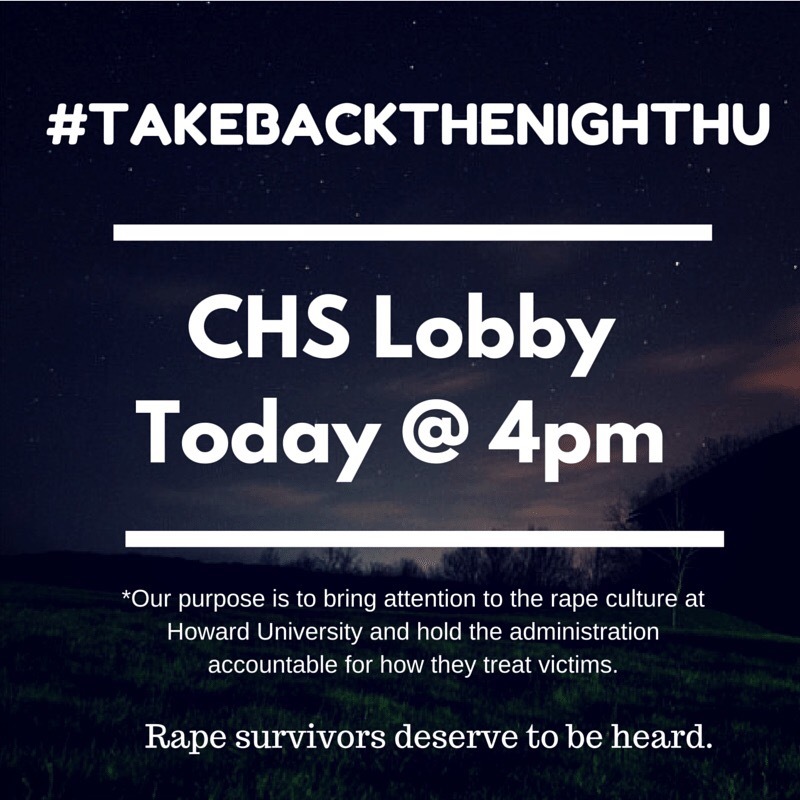 The women created a Take Back The Night HU Tumblr account and the Twitter handle @TBTNHU to spread awareness and get the word out about future events. Howard also agreed to immediately begin running criminal background checks on its student RAs. Accountability is important for McKenney. Many of their fellow students in the dorms are very grateful that Elder and McKenney decided to take action. “A lot of people have reached out to me as far as ‘thank you so much, you’ve given us a voice,’” said Elder. Despite the appreciation from her peers, Elder says she has reservations about speaking out and trying to create change at Howard. Elder explained that on the day of the first demonstration, one of the dorm building managers told the police to come and talk to her about the demonstration and what the students were trying to do. According to Elder, it seemed like the building manager was trying to get the police to arrest her because she might cause some kind of disruption. McKenney and Elder do not intend to stop their activism any time soon. Through this process both Elder and McKenney have learned about themselves, including skills they didn’t know they had. Elder is a film major and wants to be a director because she doesn’t like the attention on her, but has learned she can be very vocal when she needs to be. I really enjoyed meeting with McKenny and Elder on Howard’s campus. FIRE is always looking for opportunities to speak with students about why free speech is important to them. Students interested in getting involved on their campuses are encouraged to join the FIRE Student Network, and can to reach out to FIRE at fire@thefire.org for additional information.